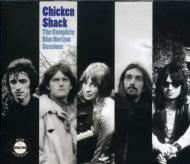 Chicken Shack were one of the seminal 1960's blues bands, mostly remembered for Stan Webb's explosive guitar playing and for containing Christine Perfect on keyboards. Later Perfect married John McVie of Fleetwood Mac and later joined them as full time keyboardist and vocalist. This 3-disc set marks Chicken Shack's journey from 1968-1970. Restored and re-mastered classic cuts providing a truly comprehensive and definitive collection of recordings during their time at Blue Horizon.